An alien has landed on my plate, what now? I’ve managed to grow Pattypan Squash for the first time – hurrah! The plant is massive and seems to be on a takeover – hmmmmm! 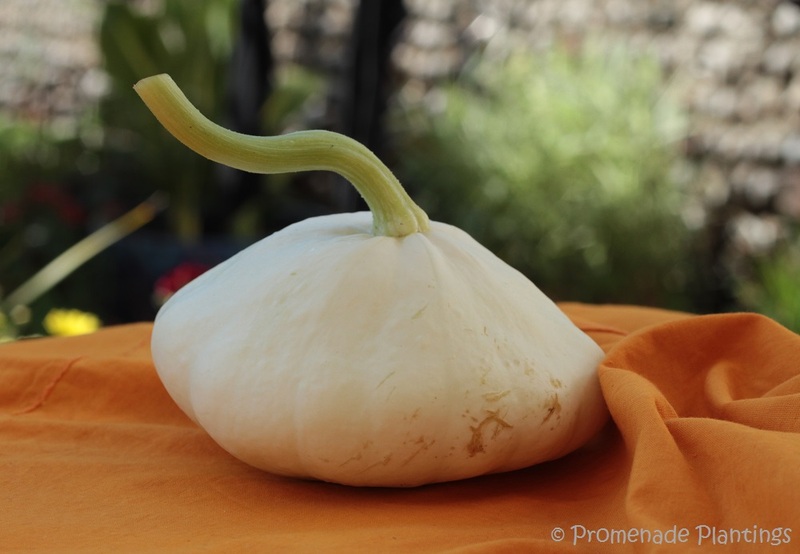 It’s produced a beautiful squash – cheers all round! I haven’t a clue what to do with it ………. As you can see Little Clanger is wondering what has happened to the Soup Dragon! So, what are your favourite ways to cook and use Pattypan Squash? Any great recipes or links to tried and tested recipes you could share? I have to admit I’m more interested to hear about vegetarian dishes, but I’m sure I can re-imagine meaty ones. And while we are asking questions are they better picked when small or left to grow a little like this one? I’m also presuming it isn’t the first and last squash that the plant will produce! so I’m sure I could get to try lots of the recipes you suggest. Hi Claire, I have not idea what to do with it but it sure looks good. I’ve never heard of Pattypan Squash (and so I have no idea what to do with it!). It looks almost too beautiful to eat. No problem! It is our favorite use of alien (or any other) squash. Oh how funny Claire! I am waiting for my pattypan squash plant to produce an offspring or two…but it has not happened yet. As a matter of fact I am hot sure why I planted them in the first place as I also am hot sure how to cook them, but I just liked the way they look!! So I will be following updates on this post to see what suggestions come in to you. I planned to just cut them up, toss with olive oil, salt & pepper and roast them and that is a far as my recipe thinking has gotten. It is just adorable! What a cute squash. I’ve never cooked with them but I look forward to seeing some of the suggestions you get. It seems oil or butter and lots of herbs are the a clear winner ! 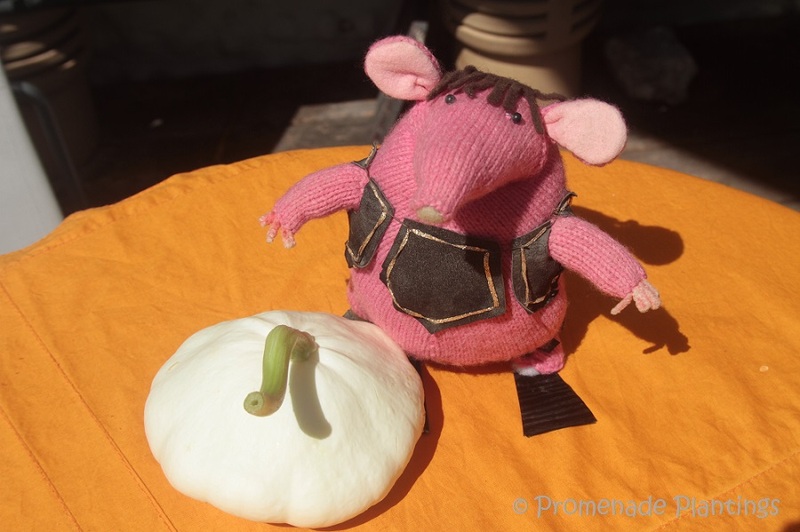 Little Clanger might be happy to hear that you can make soup with the patty pan squash… add lots of fresh herbs and black pepper. They’re good sliced and cooked gently in butter (lots of black pepper again) too. Hope you enjoy your squash whatever you decide to do with it! Aren’t the Clangers the best – mine was knitted by a friend as a xmas present, I was at least 30……. And the pattypans are new to me too, couldn’t resist some seed shopping in France when there last. That’ll learn me! Next tme: pick a tad earlier: smaller is sweeter 🙂 ! If you are on your own, I would halve top to bottom and use for two or three meals. One a Chinese strirfry for sure: whatever you favourite way is: slice top to bottom pretty finely, but do not overcook! It is fine raw: grate and use your favourite dressing: something with yogurt, chill ietc perhaps? Sure: you can lightly stufff the remainder with whatever appeals: put in the steamer for a few minutes and sprinkle with some toasted sesame seeds!! sorry about the spelling: it kind’of ‘left here’ OK 🙂 ! Brilliant Eha, just brilliant! I will definitely pick when smaller – this one was one of “those that got away” (and I have no idea how they manage t get away!). Stir fry sounds perfect as does the dippy salady thing with yoghurt. Thank you so much. I loved the Clangers too Cathy !! And I’m off to read your stuffed courgette recipe – thank you !! I half them, steam them and throw large quantities of butter at them with a grinding of sea salt and black pepper – put my feet up and devour the lot! Can’t wait to see what you make with yours. large quantities of butter and the word throw make me smile, I can do that !!! Love it – herbed cheese in summer Marie, that ticks my boxes too! Thank you and hope all is well at home and you don’t have too many doggy chewed shoes to show !! Grate patty pan and zest a lemon and chop parsley, make a risotto and last five minutes turn off heat throw in prepared ingredients, mix through and cover with tea towel, Serve with butter, parmesan and black pepper, very easy and tasty. Claire that pattypan squash is just crying out for stick-on googly eyes (my youngest likes to customize ‘weird’ vegetables with eyeball stickers). This pasta with confit of zucchini recipe is amazing and I’m sure you could replace the courgette with pattypan squash as the texture/flavour would be pretty similar I’d imagine. And thanks for the recipe suggestion I’m off for a look ….. I have enjoyed them (smaller ones) sliced thinly and baked into a quiche with tomatoes. I love patty pans in the garden because they are so unique. I haven’t grown any in a while. Now I am inspired. Maybe next year. Added to a quiche sounds perfect to ,me, I love a summer quiche packed full of treats from the garden. Thank you so much for the idea!! Clangers – the first show I can remember. I liked the Soup Dragon. Bit like a tough courgette really. I grew them last year and they were disappointing, totally tasteless. Shame as I adore courgettes and I like the flying saucer shape. I did grate parsnips into a dark chocolate cake last year and it was lovely and moist…what about grated squash in an orange/almond one? One surprising thing I learned from a Jamie Oliver programme was that there is no need to peel squash, especially when roasting….not sure if the Patty Pan would be tender enough though, reading other comments. and yes to roasting with skins on, saves a load of bother! Hi Dana, the CSA schemes sound superb, I often read blogs where people get their box and then work out what to do with the veggies! When it comes to squash, I enjoy photographing them more than eating them. I hope then that my winter squash will come good this year, as there is nothing better than photographing them – different lights, colours, textures, shapes, they have it all. I particularly like them when they are not “perfect” with dents and warts and bumps and bangs in them. I really have no clue what to do with your alien . . . Roast it, perhaps? But I do love the color and the pale green stem. It almost looks like a ceramic piece. I hadn’t thought about it looking like a ceramic piece but you are right it does, I looked at the packet yesterday and it’s a French variety – Pattison Croblan. pale white-green. rather unearthly! Chortle – cute photo. No recipes as I am away from home. These others sound tasty. 🙂 hope you are having a grand old time away! Substitute for summer squash in any recipe, do pick them young (small) they are sweeter and tastier. Thank you Norma, I’m trying to do as you say and pick them young! Claire, this is one of my favorite summer squash (squashes?) — we have oodles of them in Oklahoma. The skins are tender when they’re smaller — no need to peel. Slice thinly (I cut mine horizontally), saute them them in butter or olive oil, and throw on some Greek seasoning or herbs of choice — or freshly ground pepper & sea salt — Nature doesn’t need much embellishment. 🙂 You can also cook these in the microwave for a minute or two (sliced, buttered, seasoned, loosely covered) for a quick fix. Enjoy your alien invasion! Hi Kim many thanks for the suggestions! Greek seasonings sound perfect – I love Greece 🙂 besides I have a huge amount of oregano growing in the garden so that’s just perfect! When they are much smaller, I have had them roasted with olive oil, garlic and herbs. These are really versatile so you can bake, roast, grill, saute and just add other things that you love. If I have too many, I roast with garlic and a hot pepper and toss them into the blender to become sauce or soup. They stuff well because of their shape. I can’t recall if you are vegetarian but if not, put crumbled sausage into the stuffing and bake them. Most any recipe that I do with them spices them up quite a lot as they are very mild. Wow, what a response you have got here … loads of idea – I think it’s beautiful to have a decoration. Love your photos of the little alien. I want that little pink mouse! Or is it a rat? Hope you figured out what to do with your squash.